After a year... It's almost that time! 1. THE TYVEK BIB: You may register on-line for the World Run Day Tyvek Bib – with your Last Name included. This selection will also allow you to post your Name, City, State, Country. You also have the option to post a Dedication, Favorite Quote, Your inspirational Running Music, and other information. It will be mailed directly to your address supplied during the registration process. Note: All INDIVIDUAL Registrants will be mailed a World Run Day Event T-Shirt with a Numbered TYVEK BIB. 2. THE CLASSIC E-BIB: This is a classic bib we used 10 years ago and still works. As is our tradition for many years, the bib shall be pinned on your shirt for selfies and viddies on the day of the event. The 2018 Classic E-Bib will be available 3 days before the Event (at the World Run Day on-line Expo). It will contain your Name, City, State, Country and the Charity you plan to donate to. 3. THE BANDIT BIB: A “Bandit” is an unregistered runner who deliberately sneaks into a running event – either with no running bib or a similar looking running bib from another event. 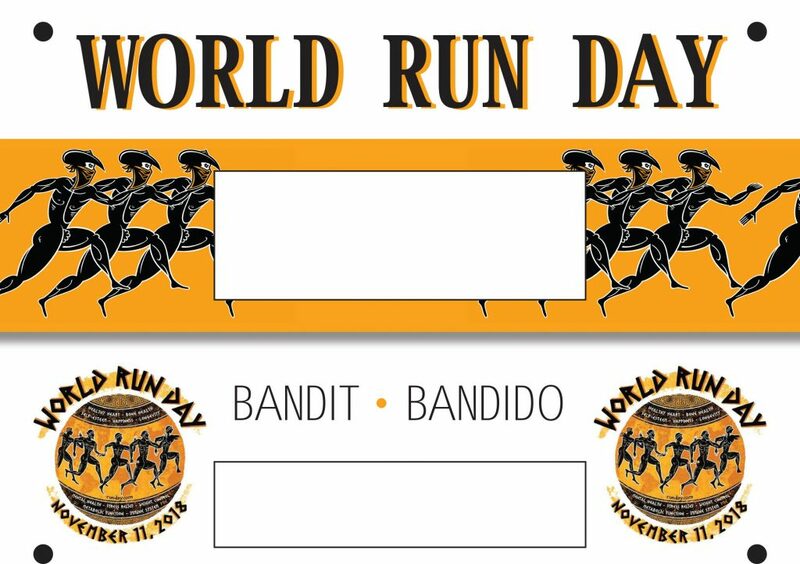 The Official “Bandit Bib” will be available the day of the event for download – at the World Run Day Expo. First, our sincere apologies to our Registered Runners. We know what it’s like when you pay for an event and someone else (non-paying) runs alongside you on the course. Event Directors worldwide consider this unconscionable. However, these people do believe in running as one of the best activities on the planet …. so let’s be a little forgiving on this day (just for our event?). We’ve indicated “Bandit” on these Bibs so there will be no mistake in spotting one. It will help to make the distinction between paid registrant and bandit. For this day, however, they will not be removed from their course. If however you, consider this nonsense and would like to shame those runners; please feel free to print this document and place on their desk or in their mailbox … or copy in an e-mail … you decide. Maybe you can change their mind about registering…? 4. 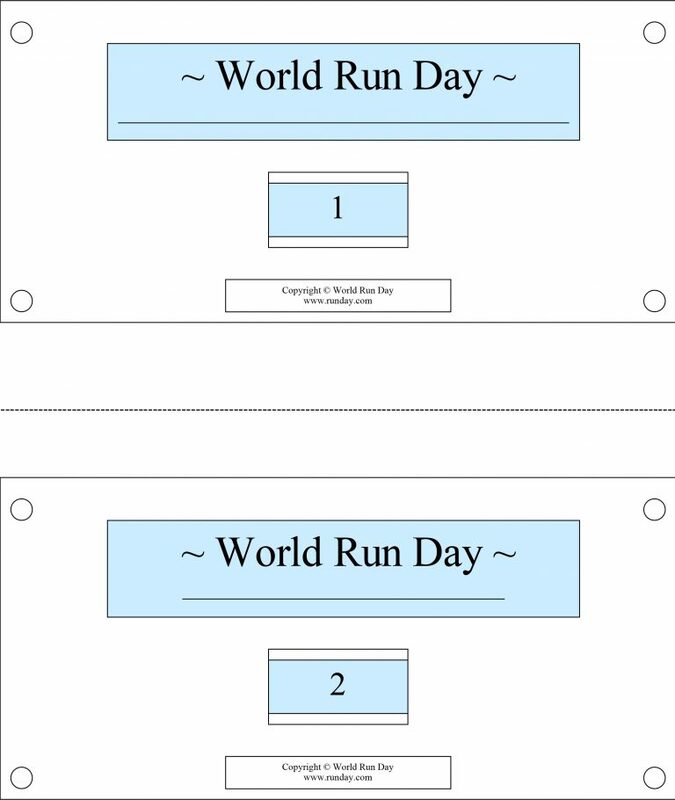 SMALL GROUP BLUE BIBS: Intended for School Groups or Small Groups of runners in need of World Run Day Bibs. This is a PDF File containing 25 hand-crafted World Run Day bibs for your event. They print out at 2 bibs per page. 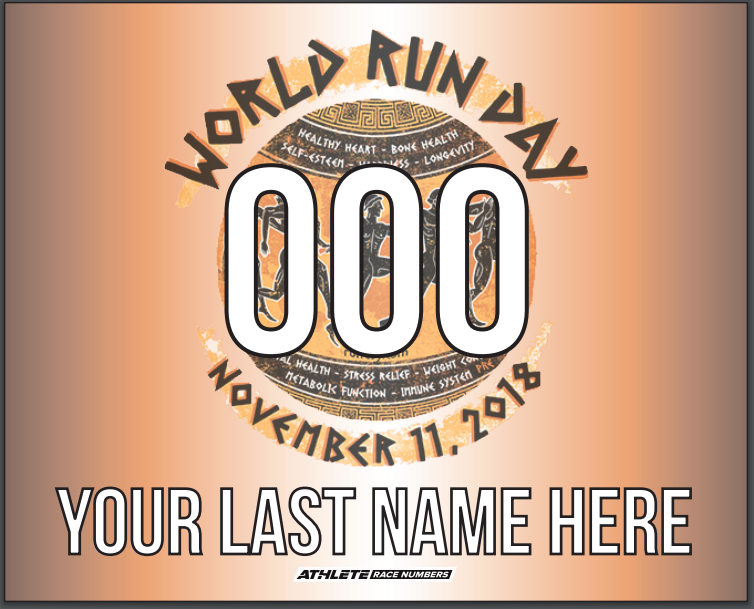 Simply use the line under the words World Run Day to write in a persons name, school, small statement of why they love running … or anything you desire. 5. 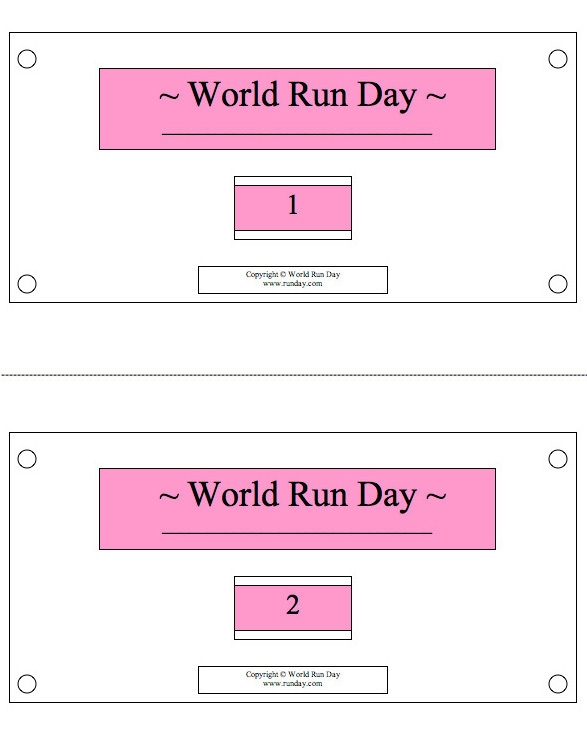 SMALL GROUP PINK BIBS: Intended for School Groups or Small Groups of runners in need of World Run Day Bibs. 6. 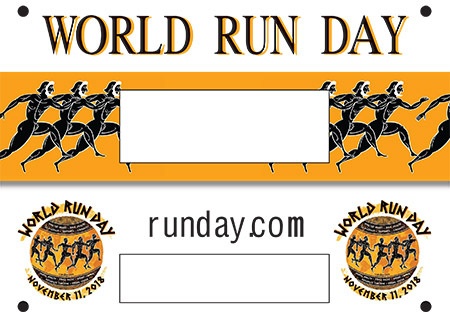 SNAIL MAIL BIB: If you still need a traditional running bib (Tyvek Material), please feel free to mail a self-addressed stamped envelope and $5.00 USD currency to our World Run Day bib fulfillment office for processing. Cost are used for purchasing Bib, Processing Mail, and Processing Currency.